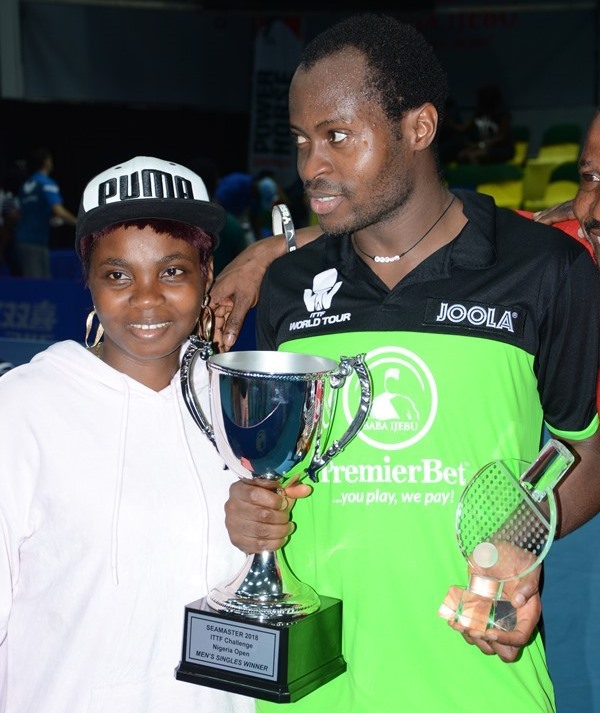 Ganiyat Aruna is a happy wife after watching her husband – Quadri Aruna claiming the men’s singles title at the 2018 ITTF Challenge Seamaster Nigeria Open as the first Nigerian to achieve such feat. Ganiyat, a former Nigeria junior international says her husband fulfilled his promise to make her proud. Ganiyat said that she supported her husband with prayers after much preparation by him, adding that Quadri had promised to make her and the entire nation proud. “My husband promised and delivered; I am so excited; this is a promise fulfilled; I am proud of him,” she told News Agency of Nigeria (NAN) after the match on Sunday August 12, 2018. The former national player and mother of three also hailed the Aruna Quadri Fans Club and spectators for support to her husband. “The French player was good, and it was indeed a tough game, but cheers coming from his (Quadri’s) fans and spectators went a long way to help in his victory,” she said. She expressed satisfaction that the victory was honour to Nigeria and brought to reality, the long-awaited dream of having a Nigerian win the tournament.